Mimio Interactive Ultra-Short Throw Projector with Two-Pen is an exciting new touch projector that aims at bringing one-to-one collaboration in the classroom. 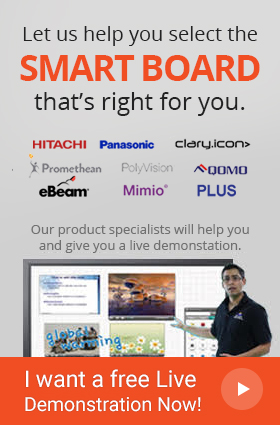 Mimio interactive projector technology is a way to improve classroom engagement by connecting with students in a way that is familiar and comfortable to them. If you already have a dry erase board in the classroom, plug the interactive projector into a computer and bring your lessons, graphics and images on a conventional dry erase board. This Mimio Interactive Ultra-Short Throw Projector with Two-Pen is a tremendously popular touch technology among educators and students alike. Not only you will get a wide range projection but in fact you will also have the ability to touch to control it. Interactive module: 2 interactive pens, MimioStudio software DVD and hardware license, Power cord-2m, VGA cable-2m, Mini-USB cable-5m, Remote with battery. Linux, Windows XP, and Vista. 3500 hours minimum. Eco mode: 5000 hours minimum. Native Aspect Ratio is 16.10. Also supports 4:3 and 16:9 aspect ratios. Two 3.5-mm stereo line level, two stereo RCA jack line level, one 3.5-mm audio out, one 3.5 mm microphone.